While the puff pastry thaws, in a large mixing bowl combine the chopped spinach, cheeses, olives, shallot, parsley, spices and seasoning. Add one beaten egg to mixture and stir to thoroughly combine. Cover and set aside until needed for assembly. On a floured surface, gently roll out the puff pastry to about a 12×16 inch piece. With a cookie cutter and a ruler, cut puff pastry into 3-inch squares. 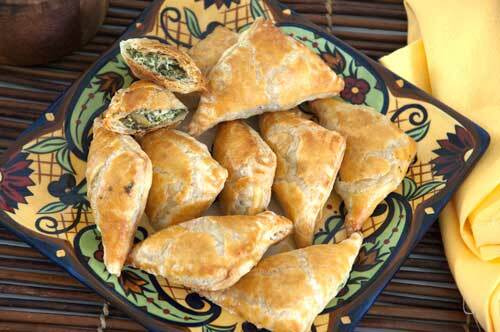 Place a tablespoon of the spinach mixture into the center of each square. Beat the remaining egg with a splash of water for an egg wash. With your finger, spread some egg wash along 2 sides of the pastry. Fold pastry over and seal with your fingers. Take a fork that has been dipped in flour and crimp the edges completely closed. Place turnovers on a parchment lined or greased baking sheet. Use remaining egg wash and brush the turnovers with a pastry brush. Bake for 15-20 minutes or until golden brown. Serve hot and enjoy! Chefs Note: Try Napa Valley Bistro™ pasta sauce for a dipping sauce.